Few of us really understand the deeper meaning of peace; instead modern life seems a never-ending cycle of demands and distractions all clamouring for our undivided attention. Today, the ultimate luxury is a place of peace where we can escape to be at one with our inner self, where our deepest questions and answers lie hidden. This type of peace requires stillness, effortless comfort and a safe haven of tranquility where we can let the mind and body rest and wander. Welcome to De Bergkant Lodge, a small town secret along the Karoo’s Route 62 in the Western Cape province of South Africa. A fascinating four-hour drive out of the bustle of Cape Town, Prince Albert is an oasis of 4-star tranquility. Today, thanks to its current owners Michael and Renate, De Bergkant Lodge is the high point of the town’s hospitality offering, set on lush lawns, with deep cool pools and spacious air-conditioned rooms which carry all the regality of the town’s name and the man himself, the imperial and renown Prince Albert, husband to Queen Victoria of England. Ever since its early beginnings in 1858, De Bergkant Lodge has always carried an air of heritage and harmony. The classic Cape Dutch building was a wedding present gifted to Helmuth Luttig and his bride Petronella, by her father Carel Lotz who was a master builder of the famous Prince Albert style gables. Today, it comprises 9 luxury rooms and suites and encompasses a new Georgian building and a 1904 Victorian house set within the estate. Lauded a Heritage site both for its history of bonhomie and its current day ‘True Karoo Hospitality’ its popularity is underpinned by 5.0 out of 5.0 stars over 343 TripAdviser.com reviews and a dynamic 9.7 rating on Booking.com. Raising De Bergkant Lodge to its title of ‘Exceptional’ wasn’t quick nor easy however. When Michael and Renate purchased the hotel from its previous owner in 2016, it was in a state of disrepair and neglect. Swiss precision stepped in and root canal renovations took place over all the buildings which are now modernised and maintained to 4-star quality, along with a newly reshaped Karoo garden featuring mostly indigenous plants and trees. It’s a sparkling and reassuring atmosphere of well-preserved South African history with an international standard in elite comfort and style which luxury overseas travelers have pinned firmly to their ‘favourites’ map – De Bergkant Lodge hosts both local and international guests in equal measure throughout the year. Languish at any one of its three pools in the hot sultry afternoons, one is 15m and one 10m in length; or swim a few refreshing morning laps before a breakfast of kings served on the pool terrace where home-made croissants and breads, cultured yoghurts, eggs, fresh figs and German Black Forest ham speak of just some of De Bergkant Lodge’s culinary delights. From here, your day is your own. Choose to do nothing, other than enjoy a steam or sauna followed by an in-room massage or get the most out your stay with the many adventure and cultural activities available. At dinner time, enjoy a pre-dinner aperitif at De Bergkant Lodge's bar lounge and then amble down the main street to one of Prince Albert’s many restaurant offerings. In the fresh mountain air of the Karoo, the night sky of a million stars will light your way home to a night of deep, comfortable and silent sleep… until you wake to another dawn and day to find yourself. Getting there: Set in the beauty of the Swartberg Mountainsringed by vineyards and fruit and olive farms and just 2 kilometres from the famous Swartberg Pass, De Bergkant is on Route 62 @Route62ZA which offers mesmerizing landscapes and local culture which will lull your mind into holiday mode. Dutch and German speaking international guests can follow the route to the De Bergkant Lodge on Du Mont travel author Dieter Losskarn’s South Africa travel book with its own map. For South African travelers, Getaway magazine have pinned De Bergkant Lodge to the luxury Route 62 map as the top-rated B&B in Prince Albert. History Speaks: Don’t miss a visit to theFransie Pienaar Museum with local history exhibits which includes fossil displays and a working moonshine distillery. Its also the starting point for the fascinating Ghost Walk Tour by The Story Weaver which is not to be missed! Love and Laughter: De Bergkant Lodge is the perfect weekend getaway to renew your wedding vows or even propose this Valentine’s Day. Don’t have a significant other? Then take your furry or feathered best friend with instead; De Bergkant Lodge is #petfriendly. Regular guest Bernard and Jourina are often spotted there with their love bird Valentine. And... check the arts calendar of the Art Deco styled The Showroom Theatre on Main. This February features the beloved South African personality Evita Bezuidenhout’s ‘When in Doubt, say Darling’. Rest and Shine: The 19th-century Swartberg Pass runs through the Swartberg Nature Reserve offering dramatic mountain views and the reserve is dotted with caves featuring San rock art and a variety of wildlife for either hikes, mountain biking or 4x4 adventures for the mornings. Take a book with you for the afternoons and languish on De Bergkant Lodge’s pool loungers with intermittent dips into the cool waters or doze off to the sound or bird song – whether inspired to hike, read, write or doze expect something delicious to spring forth in your soul. Talk of the Town: Michael and Renate are attuned to your tastes and are happy to recommend and book your lunch or dinner at the best local restaurants in Prince Albert and can point out the best travel spots to visit and explore during the day. 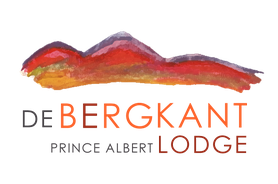 De Bergkant Lodge believes in supporting local artists. Look out for the hand-painted room plagues featuring local flora (the artist can often be spotted as he resides on the property) and in room décor from Avoova made from handcrafted layers of ostrich eggshell designs, which come from the local factory and shop in Prince Albert and make wonderful gifts to take home with you. Call Michael or Renate now on +27 (0)23 541 10 88 or book through their website at www.debergkant.com and start planning your own Peace of Heaven. You can follow them on Facebook, Instagram and Twitter.